Yet another release from the Delicious series is available for your long holiday weekend! Delicious: Emily's Message in a Bottle Collector's Edition is one of the fans' favourite hits. This release is about Emily's childhood and the beginning of the family business. There is a sentimental added to the story when you meet the grandpa and learn about his sweet wife, the grandma. If you are a time management genre, and specifically this series, fan you are familiar with many of Emily's friends and family members. You have probably been through a lot with Emily too! This title entroduces you to Emily at the age of three, her uncles, and her Grandpa. 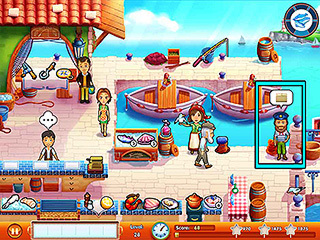 The message in a bottle in the magic thing that puts the past and the present together and now you find yourself working in your modern day restaurant as well as learling a whole lot about the family business roots. There is a sentimental added to the story when you meet the grandpa and learn about his sweet wife, the grandma. You see him go through the tough time of missing her after she's gone. By the end of the game, you feel like you are part of the family! All the audio-visuals are quite fitting. All the different locations you are going ot work at are bright and colorful. Cute characters and little details for different themes. The game offers three modes of difficulty (Beginner, Normal, and Expert) as well as a Tutorial and a How To guide for those new to the genre. You basically go through the same familiar motions here. The customers decide what they want, you get it, serve it, and get paid. The faster you do this,the happier the customers are, and the better your results. There is a mouse to catch for extra points. Your menu gets complicated with time and of course, more upgrades become available to you as you make more and more money. 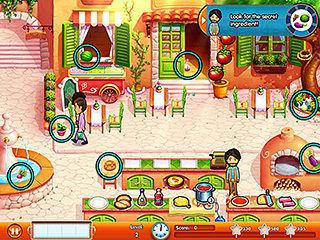 The game features over 90 levels, which isn't too many for a time management game collector's edition. You get to earn 14 achievements. 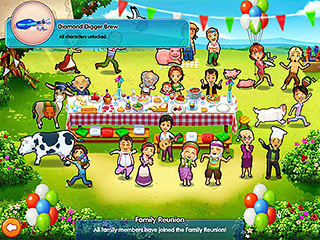 If you play challenges and bonus levels, you get diamonds that are used for family reunions. It a new fun adventure with Emily. Check this out for your entertainment for this weekend! This is Delicious: Emily's Message in a Bottle review. Download this game here.